Co-creators of landscape, ecology, and the very evolution of our planet itself– herbs and minerals have been allies since the beginning. Many ancient systems of healing arose from experimenting with the alchemy of these two foundational earth medicines. When used together in making medicine, plants and stones can go deeper, higher and wider than when used alone. Together, these two allies can help us to access all levels of healing—from the bedrock of our innermost selves to the highest canopy of our personal growth. In this class we we’ll look at the deeply synergistic relationship between plant and stone medicine. As a group, we’ll explore the philosophy behind plant and stone formulations and investigate different methods of combining these allies to make potent medicinal elixirs. 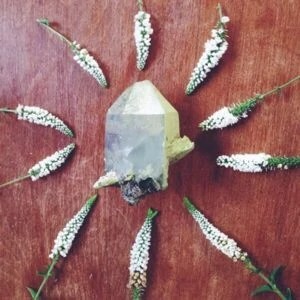 Meet a core group of synergistic plants and stones to begin your truly alchemical medicine-making practice. Taste, mix, stir, concoct— this hands on class will give you a practical foundation in creating deeply unique healing preparations. There is a great, serpentine awakening happening here on this planet. The return of the divine feminine, women’s empowerment, sacred sexuality and deep balance. As women at the forefront of this great turning, healing often arises like earthquakes from within our own bodies, beginning in our innermost sanctum— our vaginas. Like the sacred caves of Neolithic Europe, our vaginas are places where transformational energy and empowerment can be birthed into the world. And for many women, the reawakening of this power begins with the most unlikely of messengers – chronic vaginal conditions. Yeast infections, UTIs, vaginitis, and vulvodynia are conditions that affect millions of women. They are frustrating, painful and sometimes debilitating, and they are all also portals into profound healing. 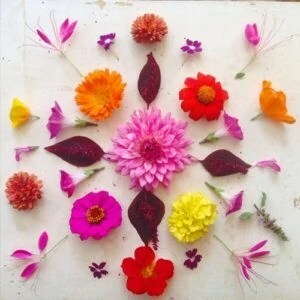 In this class we will explore how to engage with these conditions as sacred teachers and sources of empowerment, exploring the herbs, stones and practices that can help us to heal on a multidimensional level. Taught from over a decade of experience with chronic vaginal conditions and chronic pain, this course is an initiation into becoming a healed, whole and self-possessed woman of power.